Perfect for foot bath spa, also for health center, beauty salon use. Item Type: Detox Array. 1 x Detox Array Only. Clean with dish soap and water, then soak in 100% white vinegar for 10 minutes or soak in 50/50 mixture of water and vinegar for 30 minutes after each use. 1 x fir Belt. Cleanses Kidneys, Liver, And Parasites in our body. Liver Detoxification which cleanses overall body. Enhances Immune System. 1 x wrist strap. 1 x travel Case. Detail Image. We will try our best to reduce the risk of the custom duties. Universal connection pin fits almost any Detoxification Footbath. Blue Arrays × 15. Array for ionic detox foot baths. New Dual Ionic Detox Ion Foot Spa Bath Ion Cleanse 2 Fir Belts Machine 4 Arrays. Hot Sales! Black Round Arrays × 3. Through the color that demonstrates, you can understand more about your own health. The machine protect inner and outer deeply, detoxify kinds of toxins. Newest Deluxe Detox Ionic Ion Foot Bath Cell Cleanse Spa Machine Tub 2 Arrays. 1 x Detox Foot Bath Array. Relieve pain and tension, prevent diseases. Through the ion array performs its function of reducing the toxins in our bodies and regulating body function. Ion Array: approx. Function: Foot Bath Waist Belt. Dear customer， Our products are shipped from local warehouses in the UK, with fast delivery and fast logistics. Please rest assured to buy. The instrument panel key functions 1, PartA switch 2, PartA: Mode Switching 3, display PartA ion concentration, when selected corresponds to A road flashes 4, show PartB ion concentration, when selected corresponds to B road time flashes 5, PartB mode switching 6, MP3 player and stop 7, PartB switch 8, MP3 cycle keys Packaging components Host 1 Ionic head 2 Power cord 1 Wrist strap 2 Data Line 1 Earphone 2 pay Manual 1 NOTE: The item does not claim to cure or treat any disease or injury. For health reasons, there are no returns or exchanges on the purchase of foot spa unless exhibiting a genuine manufacturing fault. Detox Arrays × 2. This professional ionic foot bath detoxification system has the function of brainpower code manage. So it's suitable for clinic & renting purpose. Through the color that demonstrates, you can understand more about your own health. 1 x Detox Foot Bath Array. For More, Below Link Have a 1 to 5 year warranty program. Universal connection pin fits almost any Detoxification Footbath. Blue Arrays × 2. Array for ionic detox foot baths. New Dual Ionic Detox Ion Foot Spa Bath Ion Cleanse 2 Fir Belts Machine 4 Arrays. Best Price! Universal connection pin fits almost any Detoxification Footbath. White arrays × 2. New Dual Ionic Detox Ion Foot Spa Bath Ion Cleanse 2 Fir Belts Machine 4 Arrays. Best Price! Simple Detox Ion Foot Bath Spa Cell Ionic Cleanse Machine 3 Arrays. Universal connection pin fits almost any Detoxification Footbath. Arrays × 2. New Dual Ionic Detox Ion Foot Spa Bath Ion Cleanse 2 Fir Belts Machine 4 Arrays. Best Price! Simple Detox Ion Foot Bath Spa Cell Ionic Cleanse Machine 3 Arrays. Jobst UltraSheer is the perfect hosiery for any casual, work, or elegant occasion. Fine yarns for a sheer look. Sheer heel. Reinforced toe for added durability. Fabric Content: 81% Nylon, 19% Spandex, LATEX FREE. 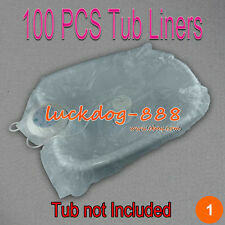 (Suitable for: Most All Ion Ionic Foot Bath Spa Detox Machine. Item included: 1 x Wrist Strap. Material: ABS Plastic & Elastic Fabric. 3) Plug and play, easy to use. 2) Color may vary slightly due to the color setting of each individual monitor. 1 X Detox Foot Bath Array. We will always here to solve them for you. It won't help the problem to be solved. Color: Black. Item Package Quantity: FeaturesGood for around 100 uses each(with proper care)Standard 1/4 inch plug, compatible with most ionic machines Stainless Steel for superior performanceLow maintenance, just spray with water and brushDetox Array CareBe sure to clean your array after each use for longer lasting performance. Clean with dish soap and water, then soak in 100% white vinegar for 10 minutes or soak in 50/50 mixture of water and vinegar for 30 minutes. If more than one person is using the array, soak in a hospital grade disinfectant for 10 to 30 minutes, rinse with water and let air dry.Special Note: The BioEnergiser foot bath is not compatible with our detox arrays. There is a special adapter you can use to convert plug types but we do not suggest it. Product Dimensions: 4 x 3 x 2 inch. Arrays × 6. Through the color that demonstrates, you can understand more about your own health. Newest Deluxe Detox Ionic Ion Foot Bath Cell Cleanse Spa Machine Tub 2 Arrays. New Dual Ionic Detox Ion Foot Spa Bath Ion Cleanse Machine 2 Fir Belts 2 Arrays. Arrays × 2. Through the color that demonstrates, you can understand more about your own health. 2019 Auto Electric MYM Derma Pen Stamp Micro Needle Roller 2PCS 12Pin Needles. 540 Titanium Premium Silver Micro Derma Roller 0.5mm Acne Scars Wrinkles DSR. 1 X TALL FOOT BASIN. 1 X FOOT BASIN COVER. 1 X FOOT MASSAGE TOOL. Multiple use, can be a perfect bucket for storage solutions. Material:Cedar wood, which is the best natural wood to hold water and more durable. 4, the ion concentration can not exceed 2.5, more than the alarm, need to change the water to redo. The Professional FootSpa is a professional ionic foot bath dual detoxification system. Ionic head 2. 2019 Dr Pen Derma Pen ULTIMA A1 Microneedling stamp 0.25mm-3.0mm Anti Acne Care. 2019 Auto Electric MYM Derma Pen Stamp Micro Needle Roller 2PCS 12Pin Needles. Detox Arrays × 2. Through the color that demonstrates, you can understand more about your own health. Th is i nt er ac ti on r ea li gn s an d ba la nc es y ou r bo dy a nd b io e ne rg et ic l ev el s. Y ou r bo dy w il l ha ve m uc h greatere ne rg y re se rv es to do w ha te ve r it n ee ds t o do, whetherh ea li ng o r de to xi ng. Through the color that demonstrates, you can understand more about your own health. Newly improved model, FIR BELT & ACUPUNCTURE function 2 in 1. Pairs of acupuncture pads(adhesive) × 2. Effective and easy detoxification.